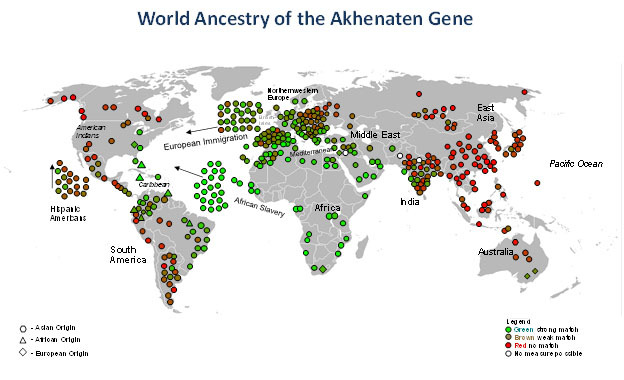 Named for the pharaoh who attempted to convert Egypt to monotheism, this autosomal ancestry marker like most of the Amarna family group’s DNA is clearly African in origin. 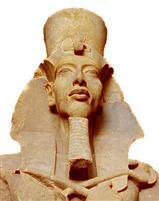 Akhenaten received it from his mother, Queen Tiye. Today, it is the gene type carried by a majority (52%) of the Copts living in the Pre-dynastic site of Adaima near Thebes or Luxor and the Valley of the Kings on the Nile River in Upper (southern) Egypt. The ancient marker makes a good showing in the Middle East and in Jews as well as parts of southern Europe close to Africa, such as southern Italy and Spain, but it is reduced to low levels in Asia and the Americas (except where brought there by Africans or people carrying some African ancestry). About 2 in 5 Africans or African Americans has it. Among Melungeons, the figure is 1 in 3. The Akhenaten Gene, like others in the Amarna mummy series, is African in origin with an important Egyptian and Arab distribution. It also appears in certain Jews, Native Americans and Melungeons.